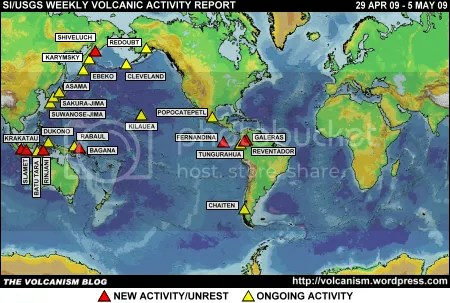 Posted by admin in activity reports, Ecuador, eruptions, Fernandina, Galapagos, natural hazards. Fernandina, Galapagos Islands, 12 April 2009: detail of the vents in the radial fissure where the lava flows originate (photograph O. Carvajal, Parque Nacional Galápagos, courtesy Instituto Geofísico, Ecuador). There’s always some interesting volcano somewhere that waits until this blog is on holiday and then erupts. This time it was Fernandina (also known as La Cumbre) in the Galapagos Islands, which began to erupt over 10/11 April 2009. Fortunately Dr Klemetti at Eruptions was not on holiday and has very full and informative coverage: Fernandina at Eruptions. The latest reports in Ecuador focus on the damage the eruption has done to wildlife around the volcano. El Comercio quotes a Galapagos National Park spokesman reporting that fish and fur seals have been killed by the entry of lava into the ocean, but also pointing out that there is nothing unnatural about volcanic activity: this eruption ‘is part of the processes of the shaping and evolution of the ecosystem’. Posted by admin in activity reports, Alaska, Arenal, Batu Tara, Caribbean, Chaitén, Chile, Colima, Costa Rica, Dukono, Ebeko, Ecuador, eruptions, Fernandina, Galapagos, Hawaii, Indonesia, Japan, Karymsky, Kilauea, Kliuchevskoi, Koryaksky, Llaima, Mexico, Papua New Guinea, Rabaul, Redoubt, Russia, Sakura-jima, Shiveluch, Soufrière Hills, Suwanose-jima, Tungurahua, Weekly Volcanic Activity Reports. The Smithsonian Institution/United States Geological Survey Weekly Volcanic Activity Report covering 8 April 2009 to 14 April 2009 is available on the Global Volcanism Program website. The following is a summary and not a substitute for the full report. New activity: Ebeko (Paramushir Island), Fernandina (Galapagos Islands, Ecuador), Kliuchevskoi (Kamchatka, Russia), Llaima (Chile), Miyake-jima (Japan), Redoubt (Alaska, USA), Sakura-jima (Japan). Ongoing activity: Arenal (Costa Rica), Batu Tara (Komba Island, Indonesia), Chaitén (Chile), Colima (Mexico), Dukono (Halmahera, Indonesia), Karymsky (Kamchatka, Russia), Kilauea (Hawaii, USA), Koryaksky (Kamchatka, Russia), Rabaul (Papua New Guinea), Shiveluch (Kamchatka, Russia), Soufrière Hills (Montserrat), Suwanose-jima (Japan), Tungurahua (Ecuador). 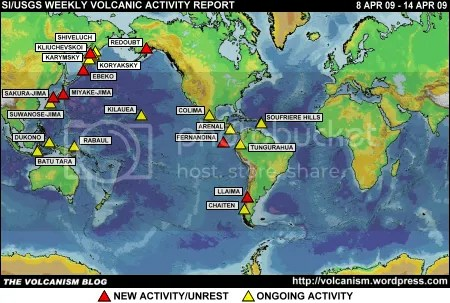 Posted by admin in activity reports, Cerro Azul, Ecuador, eruptions, Galapagos, volcanoes. The eruptive episode of the last few days may be over, but the latest (5 June 2008) Instituto Geofísico bulletin (PDF) on Cerro Azul paints a picture of significant ongoing activity. As predicted in the preceding (3 June 2008) IG bulletin (PDF) eruptive activity has developed at a new location. The first part of the report provides some information about the eruption of 29 May to 1 June, which ‘took place in three different locations on the outer south-eastern flank of the volcano’. There were three distinct vents involved, the first ‘near the south-east rim of the caldera … generated six different lava flows (aa type) with thicknesses of up to 5m, that descended the south-east flank of the volcano very quickly’. The other two vents, both consisting of fissures 1km in length, were situated in the central part and at the foot of the south-eastern flank. The upper of these two produced lava flows ‘of up to 15m thickness’, the lower ‘also emitted several lava flows and formed eruptive cones of a greater height than in previous cases’. ‘While this eruptive episode in this part of the volcano was of brief duration’, notes the bulletin, ‘it was however of great intensity, since the lava flows extended to about 10 km long and covered an area of about 2-3km in breadth, giving an idea of the vast amount of lava which was erupted’. In the evening of 3 June satellite thermal imaging revealed the presence of hot spots in the extreme south-east of Cerro Azul, which subsequently increased in intensity and migrated eastwards, ‘suggesting that new volcanic activity could have been initiated at this fresh location, as envisaged in our Special Bulletin No. 2 and as occurred during the eruption of 1998’. An overflight revealed a new 400-500m fissure on the eastern flank of Cerro Azul, where the volcano borders the neighbouring Sierra Negra volcano. Lava from this fissure was flowing towards the southern coast of the island of Isabela, and scoria blocks were being ejected to heights of up to 60m above the fissure. A northward-trending eruption column 50km in length was observed during the overflight and confirmed by satellite imagery. The continuing presence of hot spots at this new location has been detected by satellite, ‘so it is presumed that this [eruptive] activity is continuing’. While activity has decreased significantly for the moment and the emission of lava flows has ceased, a resumption in the coming days cannot be ruled out; it must be recalled that in the 1998 eruption, the activity was initially localized in the south-east flank, but a few days later the activity was located within the caldera, and lava flows were registered in the interior of the caldera. In the event that the latter situation is produced, since a gap exists in the interior of the caldera, there is a high likelihood that phreatomagmatic explosions will be generated, that occur when magma comes into contact with water, as attested by the deposits of volcanic material left on the edge of the caldera during past eruptions of the volcano. 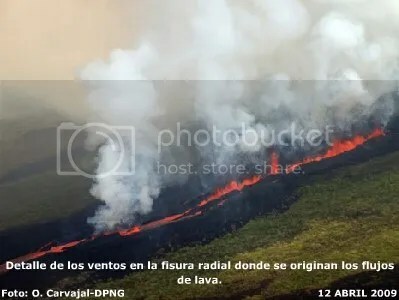 A report from Terra España, quoting Galapagos National Park (PNG) officials, describes the seat of the eruption as ‘a radial fissure forming a crack about one kilometre in length, with a chain of small cones from which lava was expelled’. According to the PNG, only non-endangered species of flora were damaged during the eruption, there is no danger of forest fire because of the high rainfall at this time of year, and that no further damage from the lava is anticipated. 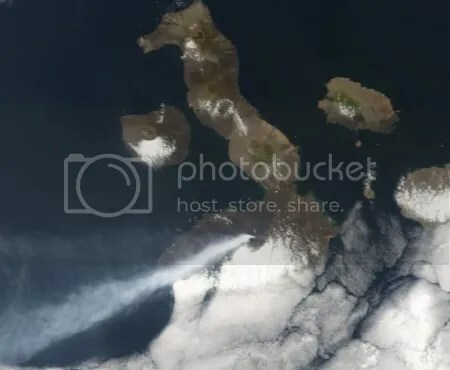 The satellite image (VAAC) of 07:15 (Galapagos time) this morning showed the presence of an eruption column, probably with low ash content, extending some 75 nautical miles to the north-west of the volcano. At the time this report went to press the presence of a hotspot in the vicinity of Cerro Azul could still be observed, so the production of lava flows is certainly continuing. Galapagos National Park personnel are currently conducting an overflight at the volcano, to ascertain more precisely the location of the eruptive centre and carry out an initial assessment of the spread of lava flows and their likely impact on the fauna and flora of the area. Initial information from the overflight indicated that the eruption originates on the south-eastern flank of the volcano. ‘The eruption is a natural process of regulation, as the Galapagos Islands are of volcanic origin’, El Universo quotes a relaxed Galapagos National Park official as saying today. The Eruptions blog has an informative report on this eruption.